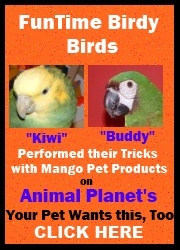 Help your bird train their way to the Parrot Olympics. These colorful acrylic trick training Roller Skates are a nice addition to your birds trick training toy chest. These well made roller skates for parrots have a sturdy, easy to grip textured foot perch, are low to the ground with large wheels and balanced for safety. They even contain a set of suction cup rods almost like training wheels so you can help your bird learn to "skate" and become accustomed to the feel of moving on their new skates. Roller skates measurements are 3" x 2 1/4" x 2", with a 5/8" diameter perch. These really cute roller skates are ideal trick training prop toy for Amazon Parrots, African Grey Parrots, Eclectus Parrots, Pionus Parrots, Rose Breasted Cockatoos, Goffin Cockatoos and...all similar sized birds. Booda Comfy Perch Large 28"
Roller Skates Trick Training Toy for Amazon/African Grey Size Parrots5Mike FletcherJuly 19, 2011Step right up. . .step right up. . . think of the yo-yo and the boomerang. . .some of the last vestiges of unexplored territory by mankind. . .but now there's even more to ponder. . .ladies and gentlemen I give you. . . BIRDS ON SKATES!! !